Politicians weigh in on morning's terror attack in Jerusalem, call for change of status and death penalty against terrorists. A number of politicians responded to the Arab terrorist attack outside a Border Patrol base in Jerusalem on Friday morning, in which a terrorist ran over five people with his car before being shot and seriously wounded. 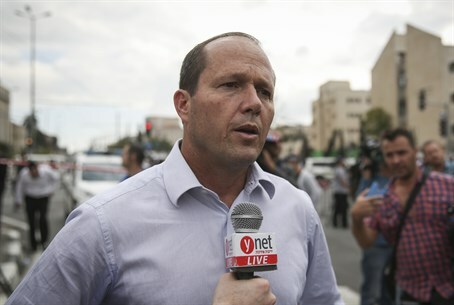 Jerusalem Mayor Nir Barkat stated "we won't let terror disrupt the daily routine of our lives, and we will continue to fight it without compromise. I want to praise the alert security forces, municipality guards, officers and citizens that brought a quick end of the event and prevented additional attacks." The mayor emphasized that "our answer to terror is a continuation of the routine, and therefore all the Purim events in the capital will continue as planned and security in the whole city will be reinforced." Barkat noted that the central Purim event in Safra Square will be in a closed and secured area, adding "I invite all residents of the state to celebrate Purim in Jerusalem and to strengthen it." Jewish Home chairman Naftali Bennett, who holds the post of minister of Jerusalem affairs, said "this morning's attack proves that talk of giving up territory of the land of Israel gives a tailwind to terror," in a reference to a document on a peace agreement proposal revealed the same morning. Eli Yishai, chairman of the Yachad - Ha'am Itanu party, called for a return of deterrence, saying "the rock attacks on the light right that occur daily and the car attack this morning obligate us to change the approach. It was again proven that you deal with terror with an iron hand." The party head, who recently promised a policy change in Jerusalem during a tour of the "seam" neighborhoods, added "residents of the whole state of Israel and particularly Jerusalem won't make do with concrete barricades." "There's no difference between a car attack, to throwing rocks or Molotov cocktails, the goal of them all is to bring about the murder of Jews. We must negate the citizenship of the different attackers," called Yishai. Also weighing in on the attack was Otzma Yehudit candidate Baruch Marzel, a nationalist activist from Hevron who is fourth of the Ha'am Itanu joint list, and who said "you need to speak with the enemy in his language. Marzel understands Arabic, and they understand him!" Yisrael Beytenu chair Avigdor Liberman said the attack constitutes "additional proof that only when the terrorists know that every attack means the death penalty and there's no chance that in the end they will be released in one deal or another - only then will it be possible to seriously lower the amount of attacks." The mention of deals comes after the outgoing coalition government released 78 Arab terrorists, many of whom committed brutal murders, as a "gesture" to the Palestinian Authority (PA) in peace talks that collapsed last year. While Israeli law includes the death penalty, it has only been acted on once in the case of genocidal Nazi leader Adolf Eichmann. Many, including Liberman and Marzel, have called to apply the penalty to Arab terrorists.